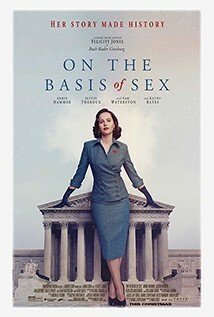 An inspiring and spirited true story that follows young lawyer Ruth Bader Ginsburg (Felicity Jones) as she teams with her husband Marty (Armie Hammer) to bring a ground-breaking case before the U.S. Court of Appeals and overturn a century of gender discrimination. Ginsburg first has to overcome gender bias throughout Harvard law school, settle for a career as a law professor because no firm would hire her, before eventually making a name for herself by championing the need for gender equality in United States’ Laws. The film premiered in 2018 in line with Justice Ginsburg's 25th anniversary on the Supreme Court. N.b. We will also be screening ‘RBG’, the Ginsburg documentary.